The length of this letter is long for a very important reason. On February 6th we had our annual business meeting and to summarize, we are doing okay. The building is in very good condition with no major expenditures foreseen for a while. The finances have been struggling with the losing and replacing of renters, yet currently things are stable. But stable is break-even at best. We have had an almost complete change in the board of trustees, but they have come together as a team and the club could be in good hands for quite sometime. The problem that has become apparent to me is; what are our long-term goals? Some long-term goals have been determined at previous business meetings. We want the building to be maintained at fairly high standards. No milking it with the thought of dumping it in 20 years. We want our history (including artifacts) preserved. We can do both of these for many years with the current business plan of trying to break even in good years and pull a few thousand out of cash reserve in the bad years. The problem will come when 15 years from now it will be time to paint the building again ($20k) or 30 years from now replace the roof ($40k) -these are today’s prices, by the way. In the past, these large maintenance items were basically covered by our income from the interest of our cash reserve. Our interest income is now 20% of what it once was. So do we take our very safe 1% CD and invest it into a relatively safe 3% bond or a slightly riskier 5% (historic average) mutual? Then there is real estate at a 10% return, but riskier still. How about if Polish history is tied to the investment? Should we purchase the historic Polish St. Peter & Paul Catholic Church as a 2-apartment rental with the sanctuary renting for whatever? As for our history, how far do we go? On May 6th it will be the 100th anniversary of the grand opening of our building –our club’s 100th anniversary was celebrated 3 years ago. Twenty years ago, to mark the 80th, we put a 16-page insert in The Daily World. However, the media world has changed. How do we best let our community know about our building’s contribution to the social, political and religious organizations; to the performing arts, the myriad of family functions and the just good times? Truly, the Polish Club can claim to be the most HISTORICAL BUILDING IN ABERDEEN! How much are we willing to do and spend to get this message out? Think about these things. Talk to others about it. Bring your opinions and suggestions to the next club functions (Oyster Feed– April 9 or Mother’s Day Breakfast– May 8). Write, call or email. Continuing business is fine, but I believe it is, long-term, a slow death. Making changes and/or taking chances could be a big mistake, but it is quite possible the only way to keep the Polish Club legacy continuing on for another 100 years. Easter is a major holiday in Poland, and Easter celebrations are not limited to Easter Sunday. Easter-related traditions take place for more than a week in Poland. From Palm Sunday to Wet Monday, this period is marked with religious rites and practices with their origins in pagan times. It is important to note that Easter in Poland is celebrated Western Roman Catholic calendar. Click this link for more details. Easter Monday is a family holiday in Poland and is called Smigus Dyngus (also called Smingus-Dyngus), or Wet Monday, after the practice of men and boys pouring water on women and girls. However, the tradition isn’t necessarily limited to males pouring water on females – the roles are often reversed. Regional variations of the tradition are also known to occur, and a woman’s married status may protect her from being doused with water. However, it is best to assume that on this day, no one is safe from the Smigus Dyngus tradition! Traditional pisanki feature designs and colors that are particular to regions of Poland. This window features eggs in traditional designs from Opoczno, Opatow, Opole, and other regions of Poland. Traditional pisanki and eggs decorated with non-traditional designs are available for sale around Easter time. Palm Sunday in Lipnica Murowana (Poland). Competition for the highest palm. In Poland, on the Saturday before Easter, people take baskets of food to church to be blessed. On Sunday, the blessed food will be eaten. Through countless donations and efforts of members, we have been able to restore this beautiful flag. The flag was in use for years in the Aberdeen Splash Parade dating back to 1914. Restoration and framing was done with the help of Clyde and Sylvia of Frames-N-Things and now proudly hangs in our dining hall. Below, pictures show the translation and photo of the flag while in use at the July 4, 1914 Splash Parade. Our next restoration efforts will focus on restoring the drum also used in the same parade. Our annual business meeting will be held SATURDAY February 6th due to the Super Bowl. 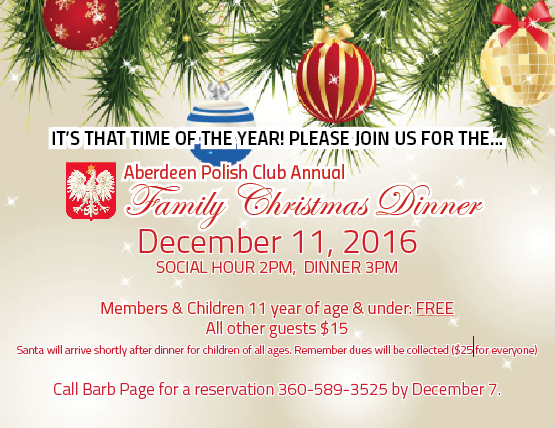 A Polish lunch (Pierogis, Gołąbki and more) will be served at 1 PM.